This is just a small selection of the many reviews of Franpos that customers have left us over the years. iConnect POS is an example of the perfect, astute approach to the evolution of the POS industry. I cannot iterate enough the importance of being a customer of a company that has this level of forethought in play. With insight like this, you can bet the bottom of your inventory that this company will give you the tools to succeed–not only now, but in the future as well. Thank you, iConnect, for the platform, products and services to help me achieve at the highest level! All of the members of iConnect are awesome. Ryan is great with support and helped me with all I needed to get my store running. Great job guys! I have never had such great customer service as I have with this company. I was getting ready to leave for my conference. I called and talked to Chris and he help set up my point of sale on my iPad. It took a lot of work on my part taking photos of all of my product and getting him on my iPad but Chris was there with me every step of the way giving me clear instructions on how to do it. I would recommend iConnect for anyone who needs a point of sale platform. iConnect has drastically changed how I run my business, out with the pen and paper appointments. Hello simplicity. Thank you team iConnect! I’ve been an iConnectPOS Customer for about 9 months; 7 months just for inventory control and 2 months live in the shop. The app is easy to use and offers many features that similar solutions do not provide. Compared to ERPLY, Vend, ShopKeep, Revel, and Lightspeed, iConnectPOS is a bargain. Like all software, we’ve found a few bugs, but the iConnect support team is very responsive and always willing to help and fix the problems. This is a critical point for business that will use iConnect as a critical business system. Spoke with Ryan who helped get my account set up. Tons of cool features and very easy. I have tried a few of the trails with other companies out and this one exceeds them all. A demo and account setup help is very helpful if you plan to use a lot of the features. iPad is awesome but I also use the web for more of the back office features. They also helped me get a better processing rate which was a breeze. I use the iconnect app for all my salon and boutique services and I absolutely love it. It’s user friendly and the staff are amazing. I definitely recommend this app!!! Super impressed with this app. Definitely will be the next wave of point of sale systems. As a small business owner, I can’t recommend it highly enough! This is a good mobile pos system with a good back end reporting system. However it does still need work. The newer version has been slated to come out for sometime now, but the date keeps getting pushed back. 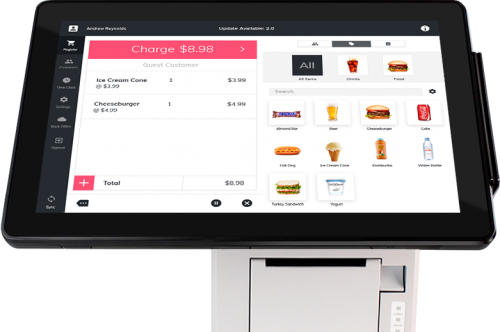 Remember this POS system was not designed for all business types, but if you are willing to rework how you conduct business iConnect POS it does have some pretty basic business needs with minimal glitches. Over all it’s worth a try. It’s no contract which is great. I can’t wait to see the newer version. Very cool app. So many cool things in one platform makes it a lot easier to stay organized. I was a Square user until I saw my first demo of iConnect. 5 stars for this company. Way better than other POS systems. I am able to track my inventory so much more efficiently using iConnect POS! Setting up my account took some time, but the iConnect employees were a huge help during this process. I am so happy with the system! Finally a proficient app. All my employees love it and I love it the most. It is very user friendly and convenient. Totally worth it. I searched for quite a while looking for the right iPad POS / iPhone POS system for my Boutique shop. iConnect was by far my favorite. At first I was a little burned out after downloading and testing so many systems BUT it was clear that the iConnect POS iPad app and their whole team made the experience much better than the other options. The app is easy to navigate. (Which is an important aspect for me) It was fairly easy to load my items and I can manage my cash drawer, print receipts, track inventory and get all of the reports I need. 5 Stars and I highly recommend to others!! Our family small business is new to iConnect POS but we are sold! We run a small bakery for wedding cakes and special deserts. It’s easy for us to manage our sales and the handful of employees we have. We even had a customer the first week tell us that they found us through ConnectMe app. I didn’t even know that was possible. Ended up being decent sale too. It made want to leave a review and say thanks! It was very easy to set iConnect up and I LOVE using it for my salon!! It makes managing my inventory easy and handles the appointment book efficiently. Our family runs a ColorMeMine retail store. iConnect POS works well for us and we can all log in from our tablets and phones to check schedules and manage our business. We even get a lot more tips, and we never used to!!! Winner winner chicken dinner! I work with a team of mediators who use this application. We always work off site so it is nice to charge our customer prior to mediation. Our clients always get a kick out of it and it has saved us some money by catching bad credit cards ahead of services performed. If you like the iPhone/iPad, you will love this app! Have used iConnect now for a few weeks. I teach horseback riding lessons a few days a week and it works great to charge my customers when they come for lessons. I also Use the booking service to manage my appointments. Makes life a lot easier. Great app. Easy to use. Unbelievable application that has exceeded our expectations. I love being able to run things remotely from my iPhone. Absolutely love this program! Very proficient! great app, love the booking and inventory features. My employees and customers seem excited about the new iConnect Point of Sale system. I’m glad I found an app that is so easy to use. I have an iPhone and iPad so I found it really easy to set up and use. It works great for my salon. Our customers always comment about how cool it is. We use the booking system for appointments too. Nice to have all these tools in 1 app. I have actually been using the app for a while but I needed some help connecting a wireless printer and the iConnect team was very helpful. Thanks! I luv the app. There are a few bugs I feel need to be fixed. Look book keeps erasing pictures when system sync happens. For the price, I am over all pleased. This app replaced style seat, register, and wave accounting. Which is great! I love this app! The expectations to get the most out of my trial period were outlined for me and support has been very helpful in this process. After my trial period was over Scott from sales followed up with me and helped me get my subscription activated. This is so much better than what I was using before so thanks iConnect for the great product. This app is amazing. I did a 2 week trial and found it worked great for my business so I signed up. It’s very simple to use and support has been amazing. Mark answers the phone, emails and online chat promptly. It’s great to have such a great tool to help run my business. Thanks guys!!! This app is Amazing! Very user friendly. The ICONNECT customer service are wonderful. They will assist you with any questions you have. Won’t give you no for answer. It was a bit challenging to set-up our credit card readers with the ICONNECT app. Just because we have our merchant account for credit card processing and we wanted to continue using it with ICONNECT. It was a hassle at first but ICONNECT support team helped me set everything up easily. I would highly recommend this app. Iconnectpos has been great. I opened my salon and signed up for the silver package, which is great for 5 employees. Any time I have had a problem or question, everyone on the iconnect team has been very helpful. Thank you Iconnect. I had a few issues using this app initially, but customer service was great and helped work through issues. Very helpful and easy to work with. Love this app, have a small pet shop and it works great, and easy to use and set up! I have tried many POS apps and this surpasses the other hands down, not only is it supported in my region, and works with Barbadian currency, it’s interface is just simply beautiful. This is a great app for iconnect the team did an amazing job of making it really simple and simplistic to use great job iConnect POS! Let's work together to get your business set up with the most innovative franchise POS system today.